The <add> element of the <alwaysAllowedUrls> element specifies a unique URL that request filtering will always allow. The <alwaysAllowedUrls> element contains a collection URLs that request filtering will allow, which override the values in the <denyUrlSequences> collection. IIS 10.0 The <add> element was not modified in IIS 10.0. 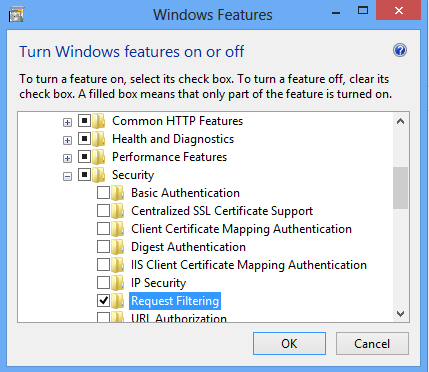 IIS 8.5 The <add> element was not modified in IIS 8.5. IIS 8.0 The <add> element was not modified in IIS 8.0. IIS 7.5 The <add> element of the <alwaysAllowedUrls> element ships as a feature of IIS 7.5. IIS 7.0 The <add> element of the <alwaysAllowedUrls> element was introduced as an update for IIS 7.0 that is available through Microsoft Knowledge Base Article 957508. IIS 6.0 The <alwaysAllowedUrls> element is roughly analogous to the [AlwaysAllowedUrls] section that was added to URLScan 3.0. 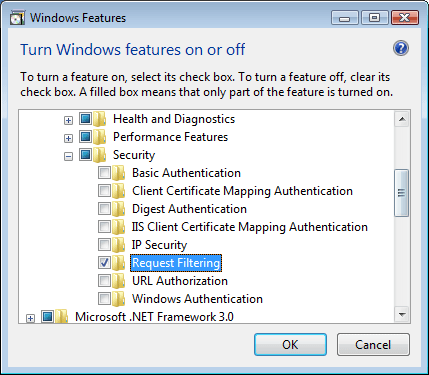 The default installation of IIS 7 and later includes the Request Filtering role service or feature. 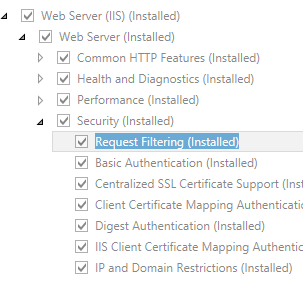 If the Request Filtering role service or feature is uninstalled, you can reinstall it using the following steps. 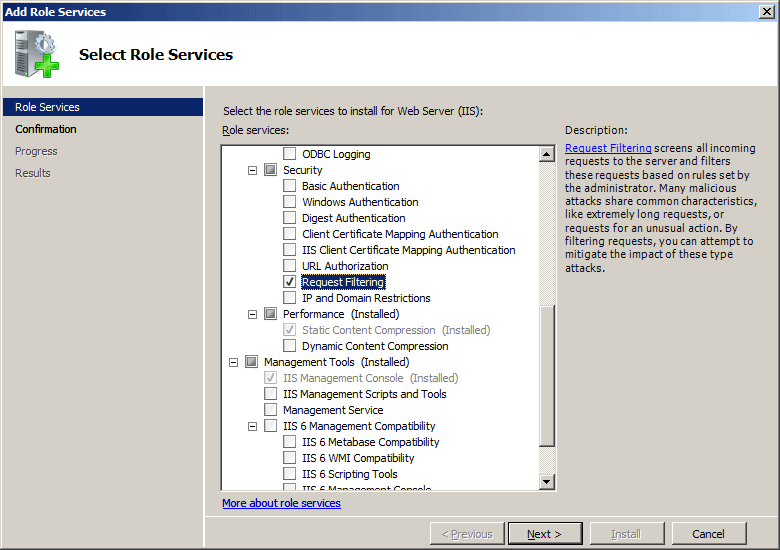 On the Server Roles page, expand Web Server (IIS), expand Web Server, expand Security, and then select Request Filtering. Click Next. Expand Internet Information Services, expand World Wide Web Services, expand Security, and then select Request Filtering. 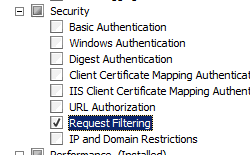 On the Select Role Services page of the Add Role Services Wizard, select Request Filtering, and then click Next. Expand Internet Information Services, then World Wide Web Services, and then Security. 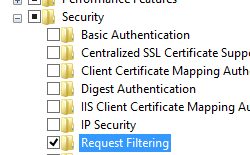 Select Request Filtering, and then click OK. 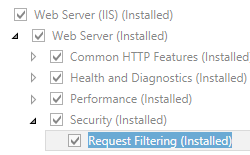 In the Connections pane, go to the connection, site, application, or directory for which you want to modify your request filtering settings. 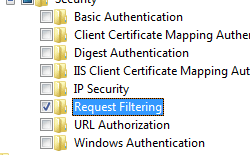 In the Home pane, double-click Request Filtering. In the Request Filtering pane, click the URL tab, then click Allow URL... in the Actions pane. In the Allow URL dialog box, enter the URL that you wish to allow, and then click OK. The <add> element of the <alwaysAllowedUrls> element is configured at the site, application, or directory level. Specifies a unique URL to always allow. There is no default value. The following sample illustrates a combination of a <denyUrlSequences> element and an <alwaysAllowedUrls> element that will deny any URLs if they contain either of two specific character sequences, but will always allow a specific URL that contains both of those two specific character sequences in a particular order. The following examples demonstrate how to add a URL that will always be allowed on the Default Web Site. appcmd.exe set config "Default Web Site" -section:system.webServer/security/requestFiltering /+"alwaysAllowedUrls. [url='/_allowed_url.aspx']"
adminManager.CommitPath = "MACHINE/WEBROOT/APPHOST/Default Web Site"